Axles: 3/4" bolt and nut for 3" wide, 1" or 1-1/4" bolt and nut for 4" wide, 1-1/4" bolt and nut for 5" wide. Forged steel wheels provide maximum strength and durability—even under a load as heavy as 7,000 pounds. They are virtually indestructible within their capacity range. Use them in the toughest applications and on the most demanding floors, with the heaviest loads. Tapered roller bearings are true precision bearings designed for the heaviest loads, and/or high-speed operation. In addition to great radial capacity, they have a side thrust load rating of 60% to 90% of radial capacity rating. 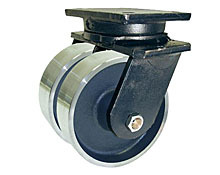 The assembly consists of an outer race or cup and a tapered cone roller assembly held in position with closures. Spacers are provided to tighten the caster legs against the bearing assembly. Two bearings are installed per wheel.